Cozumel Mexico was the first port we visited during our Carnival Valor girls cruise. I visited Cozumel on my first cruise in 2003 and was excited to go back. The one thing that clearly stuck in my mind was how gorgeous the water and beaches were. Our first souvenir on the trip was two Carnival rain ponchos. 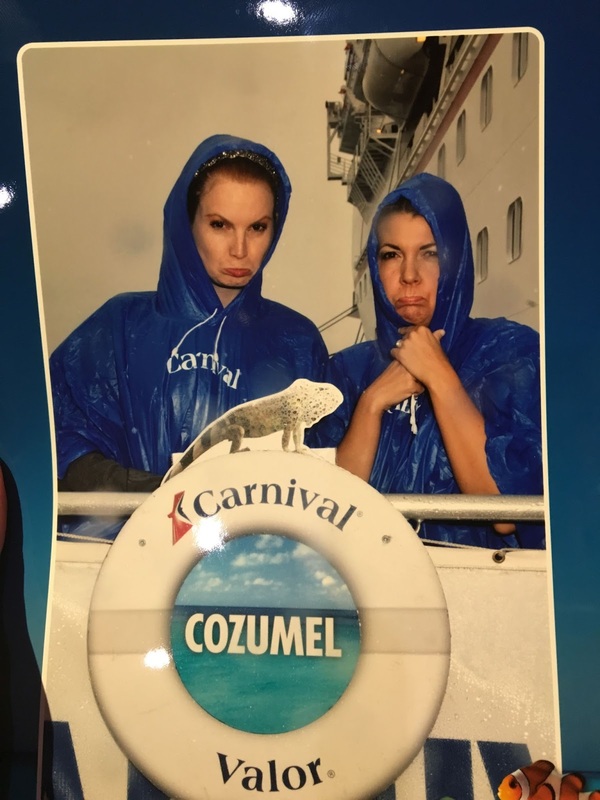 We had a 100% chance of rain on the day we were in Cozumel. Luckily we had the wifi package on Carnival so we were able to view the weather channel the night before and cancel our beach day. We headed to Carnival's excursion desk and asked for an indoor excursion. They found us an activity called Salsa & Salsa and Margaritas. We paid $70 per person for this excursion. They picked us up and dropped us off at a waterfront resort where the event took place. It was an unexpected fantastic experience and I would suggest it to anyone visiting Cozumel. We spent a few hours learning how to make 6 kinds of Salsa, two margaritas and after everyone was feeling good - Salsa dancing. The table was full of all the ingredients needed and we were given quesadillas and taquitos to go with our creations. we started off with traditional and frozen strawberry margaritas. I have tried perfecting the margarita for years and it never works. This is where my life changed - the traditional margarita has only 3 ingredients. It's equal parts of tequila and Cointreau with a splash of lime. It was perfect. Salt your glass, squeeze the lime juice in your glass. Add two shots of alcohol over ice and stir. Add all ingredients in a blender and puree. Be sure to sugar your glass before serving! Then we started on the Salsa & Guacamole. Grind garlic in molcajete until pureed to nothing. Add chile, onions, tomatoes, cilantro, salt and lime juice. Continue mashing until well blended. Grind garlic in molcajete until pureed to nothing. Add chile, onions, tomatillos, cilantro, salt and lime juice. Continue mashing until well blended. Using the other half of the Pico de Gallo, add 1 tablespoon of chopped pineapple or your favorite tropical fruit. 1/2 mango, melon or pineapple chopped. Notice Keri didn't put her drink down to salsa. Keeping it classy. One great thing the Salsa and Salsa ladies do is give back to the community. Lela the Pig raises money for those in need. Each month, they choose a new cause to donate to. Overall this excursion blew me away. I wasn't expecting much and went into it a little sad over the weather. We couldn't be happier with the decision to book Salsa & Salsa. It was an unexpected amazing experience and we give it 5 stars. Naturally, what does one do after drinking margaritas all day - find the closest bar and drink shots of tequila. Our friends back home would literally say "who are these girls". However, we learned we LOVED tequila and it made us very happy people. In fact, I purchased $100 worth of tequila at the port. Yikes. After a lot of tequila, Keri and I braved the waters and got a fish pedicure at the Port. 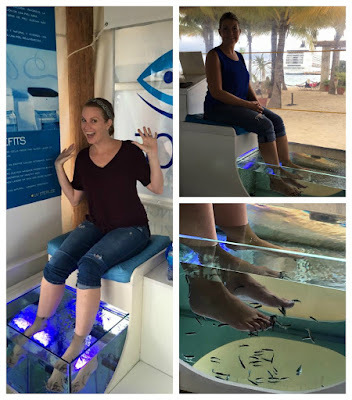 For $25, we had fish eat the dead skin off of our feet. It didn't hurt or tickle and was overall a neat experience. Both of our feet were smooth and all the callouses from running were gone. They also had booths set up for massages. We didn't have much time to explore all the shops in Cozumel. We noticed a lot of the standard port stores along with local novelties. There were tons of bars offering tequila and Mexican food. After I spent $100 on tequila, I wanted to get back on the ship before I did anymore damage.